If you've seen the first post on my Etude House K-beauty trip, you'll have seen me blogging about the awesome flagship store in MyeongDong! Today, I wanted to show you another key highlight of my K-beauty (Korean beauty, for those not yet initiated into the abbreviation) trip: the launch of the Magic Any Cushion! For those who aren't familiar with the product, one of Etude House's recently popular products is the BB cushion (another product popular among Korean beauty brands right now), and Etude House already has one BB cushion on the market. The Magic Any Cushion follows the BB cushion trend, but it's not another BB cushion. The Magic Any Cushion, which comes in three shades, are more akin to primers or colour correctors than they are to BB creams or BB cushions. In this respect, Etude House is the first K-beauty brand to launch such a product. I was told that when it launched in Korea, there were 200,000 Magic Any Cushions sold within the first few days of its launch. So the product comes with a lot of expectations! 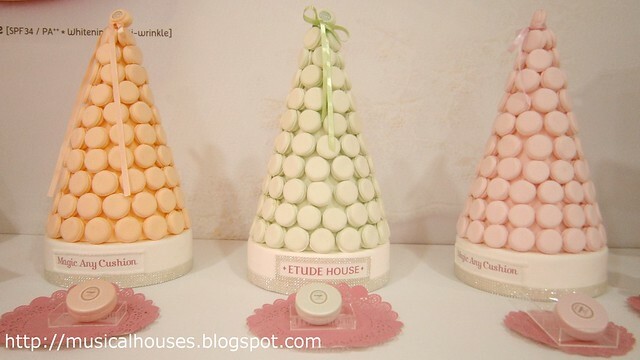 Etude House Magic Any Cushion: The three shades to be launched! The three shades of Magic Any Cushion are Magic Mint, which is a pale green shade to hide blemishes and reduce redness, Magic Peach, a pale peach which is meant to brighten up dull skin, and Magic Pink, a pale pink which adds vibrancy to pale skin. These are all very fair shades (like pastel-like and nearly white), but go on sheer. These cushions come with SPF 34 PA++ sun protection, and are touted as having anti-wrinkle and whitening properties in addition to their sunscreen protection. When I played with the Magic Any Cushion shades, it seemed like all three shades had some form of shimmer. Not big specks of glitter, but some shimmer to give a glowy look. Like most BB cushions, this one comes a polyurethane puff. Etude House has managed to dye their puffs pink. I was on hand to watch Korean makeup artist Woo Hyun Jeung give a demonstration, applying one of the shades of Magic Any Cushion (I couldn't really see which, but I think it was Magic Pink), to a model. In the photo below, the right half of the model's face has the Magic Any Cushion applied, and the left half is still bare. You can see the difference in the photo (one half looks a bit fairer and shinier). During the demonstration, Hyun Jeung shared that part of the appeal of the Magic Any Cushion was the fact that it had a very thin, lightweiht, almost-watery consistency, so no matter how much you layer, you don't run the risk of over-applying. In her demonstration she used this product alone, but you can also use it under a BB cream or foundation or whatever other base product you have. The goal of the Magic Any Cushion is to make your skin look better naturally, even before you put on your foundation. I'll admit, it looked really good on the model! Myself and Makeup artist Woo Hyun Jeung at the Magic Any Cushion event - she is super slim! Anyway, now you know what the hype is all about. 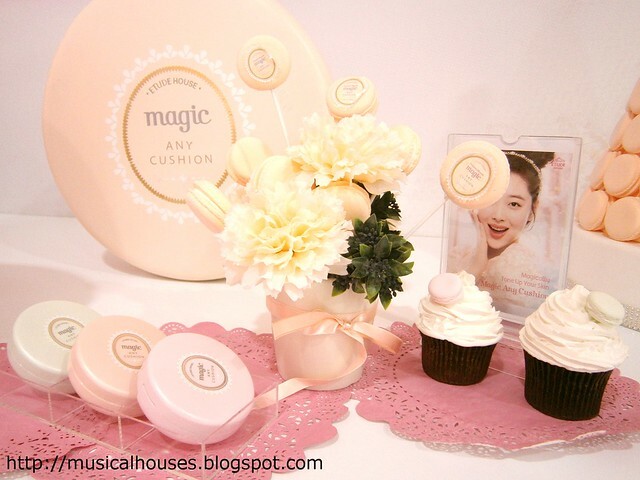 I'll be reviewing the Etude House Magic Any Cushion soon, with swatches of the three colours (they are all really pale, like almost-white kind of pale, but they are quite sheer, so you'll want to check those out if you don't have access to a physical store), so stay tuned! I was at Myeongdong around the same time, maybe I could have bump into you. Was too obsessed with Innisfree and Clio to visit anything else and I'm regretting it immensely now. The macaroon packaging is really too cute. Look forward to your review on it! I want to try these! My face is way more pink that my neck so maybe the peach one? or the green ? I'm a little afraid of the green because when the pink is gone of my face I look extra white and then my neck look a little bit yellow? (Cool yellow) or should I use pink/peach on my neck and green on my face? @Ann: The green one is actually not very green, once on and blended it looks like an off-white with a hint of green (it's a very light pale green). I think if you're unsure as to which colour to get, the peach seems to be the most universal one (since it's the closest to a beige-skin-colour and isn't as pale as the green). I do agree the pink can look a little ruddy on the wrong undertones. I'll be doing a proper review for these soon, so do keep an eye out for it! I want to try all three! My skin has a yellow / green tone but I get redness on apples of my cheeks sometimes, so I would want to try all three to see what works best for me, especially when I see myself in flash photography. Please tell us later what bb cream or foundation works best with this, in your opinion. @Jillian Reuter: It's quite a light-feeling product on, so I imagine it's probably silicone base and can go with any number of BB creams or foundations. Most of them nowadays tend to be silicone-based as well so I don't think there is too much of an issue in terms of pairing with BB creams or foundations. Of course, you can always start off with Etude House's own BB creams since the formulation will likely be similar and thus more likely to be compatible. Hope this helps!